It is the most talked-about fight of the year, perhaps for several years: Wilder versus Fury. Their very names evoke images of blood and thunder, fire and brimstone. It may – or may not – be a battle brimful of such violent attrition but it is one that because of its very nature, bringing together a reigning world champion and another, similarly unbeaten, a lineal champion who never lost his title in the ring that has the boxing world’s appetite well and truly whetted. Can Tyson Fury really dethrone Deontay Wilder in Los Angeles this Saturday night and claim the World Boxing Council (WBC) world heavyweight crown after only two lukewarm-up contests following a near three year absence from the ring? They say in the fight game that they never come back. The great Joe Louis and Sugar Ray Robinson are among the many who tried and failed; similarly Brits Ricky Hatton and David Haye. But tell that to George Foreman, slayed by Muhammad Ali in the Rumble in the Jungle but returning 20 years later to become world champion again. When Wilder and Fury enter the ring at LA’s Staples Center they embark on one of the most fascinating bouts in heavyweight history. As I pointed out when the match was made it is a massive ask for even a slimmed-down Fury, who has now shed around 10 stones since his enforced lay-off because of a contested drugs ban, to overcome the thunder-punching spindly-legged American who has knocked cold 39 of his 40 opponents on his home patch. But then, I did not give Fury a hope in hell of beating Wladimir Klitschko in Germany three years ago, when he fooled us all and in the end we were left with more egg on our faces than the Ukrainian had blood on his. Wilder is a much taller order, not so much physically but in terms of destructive power. Fury, the balding, bearded Gypsy Giant who these days looks more like a refugee from Amish territory, has never faced anyone who hits more venomously. True, Klitschko could bang but his attacking technique was predictable. Fury never allowed Wladimir’s fists near his face, having it away on his toes whenever the long-standing champion cocked those mighty mitts. 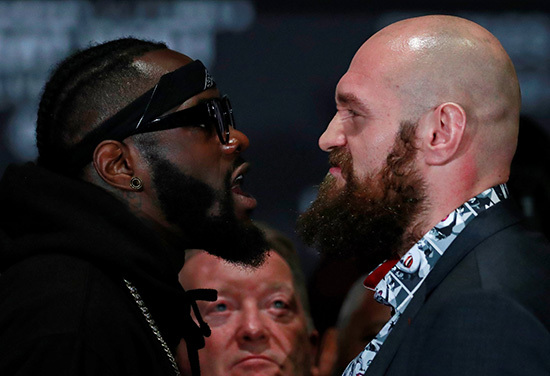 Against Wilder he surely will again need to be as elusive as the Scarlet Pimpernel while peppering away with his own ambidextrous counter-punching; yet it would not surprise me if Fury confounds us all, not least Wilder, by employing entirely different tactics to those which mesmerised Wlad. Here is the most unpredictable heavyweight since Muhammad Ali. But one thing of which I am certain is that Wilder will come out swinging from the bell, trying to ambush Fury before the bigger man has the chance to get into his evasive stride. It could all be over in the first round. Or not. 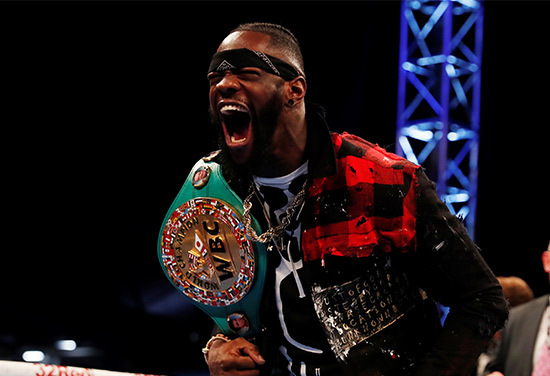 Wilder comes at you like a gale-driven windmill, his roundhouse punches smashing through the most impervious of guards, as one-round victim Audley Harrison and the 39 others he has dispatched with terrifying ruthlessness since turning pro after winning a bronze medal in the Beijing 2008 Olympics will testify. Wilder says: “I’m expecting Tyson Fury to be awkward, to be long and throwing his punches from distance and trying to outbox me. May the best style win. Briton Richard Towers has sparred with just about every heavyweight of note, including Wilder, Fury and current multi-belted world and Olympic champion Anthony Joshua, who surely cannot avoid the winner next year. Wilder, he says, hits harder than them all, harder than Joshua and “eight times harder than Fury”. He reckons Wilder has a type of power he has never experienced from any other heavyweight. “It felt like a horse kicking me,” he said. The bookies make the Bronze Bomber a short-priced favourite but the same bookies made Klitschko an even shorter-priced favourite in Dusseldorf three years back this week. However, like a number of other critics, I believe, as does his promoter Frank Warren, that Fury, who has an unblemished 27-0 record, can cause a major upset. In a poll of pundits in the November issue of Boxing Monthly, Wilder came out on top but only by 18 votes to 12. It is a contest that is more finely balanced than the Wilder camp believe. In the build-up to his win against Klitschko, Fury had only three contests in two and a half years. The issue this time for Fury is more about what he did to his body while he was away and whether the opposition he has faced since can possibly have prepared him for Wilder. Thankfully it seems that the born-again Fury has shelved his sometimes past distasteful antics, hardly putting a foot, or a word, wrong before one of the most lip-smacking heavyweight clashes in boxing history. And should he unseat Wilder as comfortably as he did Klitschko and reign again as undefeated world champion then he certainly would be hailed as among the heavyweight greats, maybe not of all-time, but certainly of his time, and rightly so. Can Fury turn the clock back three years and effect a stunning reprise? Or will Wilder sledgehammer him to his first defeat? In every aspect this intriguing match-up, televised live on BT Box Office from 11pm, and broadcast on Radio 5 Live, begs controversy – and I suspect there may well be a hugely controversial ending. So stand by your sets!